BP may not know where oil from the Gulf gusher will go next, but Intel does. 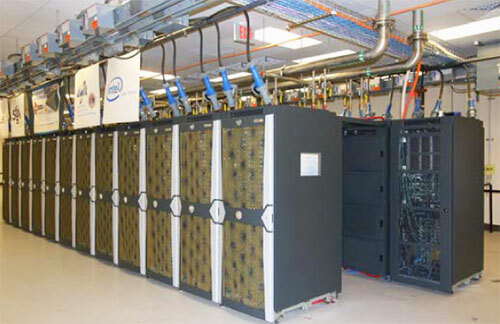 The Xeon-powered Encanto supercomputer, located at Intel’s Rio Rancho campus, is one of the fastest supercomputers in the world. And all of its 3,500 quad-core processors are devoted to tracking the potential paths of the BP disaster. of computer time using the Parallel Ocean program, a 3-D ocean circulation model design at Los Alamos National Laboratory. Intel researchers plugged in the latitude and longitude of the Gulf disaster to see where an electronic “dye tracer” dropped in the water might land. The results aren’t encouraging. Once the oil moves past Florida to the Gulf Stream, it could carry oil up to 3,000 miles each month–to the East Coast and beyond. From these simulations we can say with a high degree of certainty that it is very likely sometime in the next six months that oil from this spill will get into the Atlantic,” said oceanographer Synte Peacock of the NCAR, who is running the project. “We can say that when it happens, it will be fast, much faster than anything we have seen so far,” she said. Grim news, perhaps, but making some sense of the disaster’s direction does offer some comfort. If only we knew how to stop the toxic undersea oil cloud from creeping toward our shores.